Fortunately, there is no gunfight to the death over who would own the gold. Eva and Rosa are now outside in the garden, where it is explained that the risk associated with murder is not acceptable, especially in an isolated island where a killer would soon be found out. (Previous arcs notwithstanding: a full-fledged criminal investigation lasting more than just a single day should make it easier to find the perpetuators.) Oddly enough, just not wanting to kill anyone or some moral reason are not mentioned. 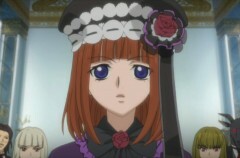 Rosa would rather have something rather than nothing, and she does ask for 150 million yen worth of gold before March. Her financial situation is dire, obviously because she was the guarantor for failed loans as was explained by Klaus in episode I-I. Given how even that large amount of money would be minor compared to the total worth of the ten tons of gold, Eva is willing to do so. In return, she requires that Rosa keep the gold’s discovery secret until she figures out how to convince the brothers that she deserves to be the head of the Ushiromiya family. Rosa asks if Eva is being truthful, and Eva answers that she intends to split the gold between the siblings. I believe her, although no one should be under the illusion that she would split the gold evenly or give up the family headship. However, someone is very unhappy about Eva’s intentions, and that is Eva’s alter ego, who throws a tantrum on top of the pile of gold, unwilling to give away any of the gold as the presumed new head of the family. This is when Beatrice shows up, who congratulates the young Eva for solving the inscription. Giving Eva the Ushiromiya family ring, Beatrice accepts her as the new head of the family and intends to grant Eva the title and powers of a witch. With the help of Vergilia, meta-Battler is able to make some preliminary conclusions. It is true that Eva finding the gold means that the wealth and family headship are hers, and the entire witch succession ceremony is just a representation of that fact. And while it is not certain what the young Eva is, she should be thought of as a representation of Eva’s inner thoughts for now. 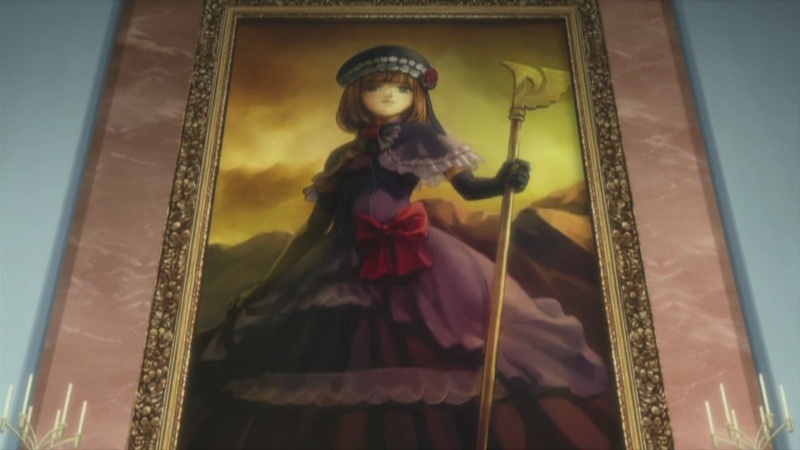 Of course, now that Eva is the new Beatrice, this means that the former Beatrice no longer has a name. The former Beatrice is all fired up looking for a cool new name, but meta-Battler doesn’t want to devote too much thinking time for her and says that “Beato” is more than a good enough name for her. Beato is used to being called that, but it is sort of boring. Of course, “Beato” (beh-ah-toh) as a nickname for Beatrice totally makes no sense except in Japanese, but then again everyone on Rokkenjima speaks Japanese. Back in the real world, Eva and Rosa return to the rest of the parents together. Eva looks pretty bad, and Hideyoshi takes her to their room because there seems to be a slight fever, which does not seem serious enough to warrant the attention of the doctor. The other parents except for Rosa are not surprised that someone would get sick with the stress and lack of sleep, while Rosa knows about the gold’s discovery and no doubt realizes that it is related. Back in their room, Hideyoshi has a hand on Eva’s forehead and Eva is enjoying the attention. Not so serious talk about Hideyoshi’s hand magically healing Eva’s fevers in the past brings up the topic of magic, where Eva reveals that she had not believed in Beatrice the witch of the forest. In fact, she had thought that if there was a witch on the island, it was her inner voice that talked to her all her life. She is actually frightened right now because she feels that the witch inside of her is going to take over, and she pleads to Hideyoshi to not let go of her. This is when they hear a cry outside their room. It is Maria shouting about wanting to check on the rose that Beatrice revived in episode III-I, while Rosa is barely holding in the urge to smack down Maria. Hideyoshi asks that Maria keep quiet because Eva is resting, but it doesn’t work, so Rosa takes Maria outside to the garden to check on the rose. It doesn’t take long to find the rose marked by a candy wrapper, similar to what was done in episode I-I. Rosa is alarmed when someone approaches them, only loosening her guard when it turns out to be Eva. Which is odd since Eva is supposed to be resting in her room, not to mention how she seems to be feeling much better and no longer willing to share the gold. It should be odd, since Eva is in her room, writhing in agony while making sure Hideyoshi does not let go of her. The Eva in the garden reveals herself to be the new Beatrice, which is weirding out Rosa about how a young version of her sister is claiming to be a witch. On the other hand, Maria is delighted about meeting Beatrice, although not a word is said about how this is a different Beatrice than the one she met in episode III-I. The new Beatrice was rather out of her element during the succession ceremony, but she is quite enthusiastic about being a witch by now. She intends to carry out her own revival ritual, and she learns from Ronove that she has the power to realize anything she imagines. The first sacrifices she chooses are Rosa and Maria, and the first thing she does is raise them high in the sky and dropping them to their deaths. Reviving them, she torments them inside a jell-o dessert and then crushes them under a cake congratulating the birthday of “EvaBeatrice”. She is having way too much fun, while on the other hand, I would love to ask Maria if she is so happy to see Beatrice now. Beato is having great fun as well as she watches what is happening, but meta-Battler is very angry and wants her to stop it. Vergilia is unable to do anything about it since she and meta-Battler are not part of the game board, while Beato is not quite able to understand why anyone would not enjoy the amusement. This earns a slap from meta-Battler, who is now completely fed up with her and does not want to see her again. Interestingly, his disappearance is accompanied by what looks like the same defensive power Shannon exhibits. Beato actually seems to be bothered by meta-Battler’s reaction: she had considered her actions as pranks rather than something to be hated for. She seeks reassurance from Vergilia, who instead has nothing to say and is willing to merely watch, and Vergilia withdraws as well. Ronove is of no help, either, since he says that even a devil such as him has an inkling of what the others are feeling and that Beato is just too insensitive, and he just can’t help himself from laughing with amusement. Annoyed by Ronove’s inability to stop himself from laughing, Beato has him withdraw. Despite her insensitivity, Beato is bothered by the others’ reactions, so she shows up in the real world to rein in her successor a bit, who is having a grand time trying to think of more twisted things to do. 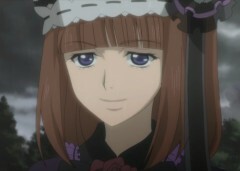 The new Beatrice has the sacrifices for fulfilling the second twilight, so Beato wants her to stop fooling around. The new Beatrice points out how impressively cruel Beato had been previously, and Beato admits that she may have gone too far. Beato is clearly unused to moderation, and it shows with how awkward she is being. Beato is going to show the new Beatrice how things should be done. While Rosa pleads for Beato to at least leave Maria alone, Maria brings up how Beato promised to take her to the golden land. But Beato is no longer Beatrice and can no longer keep the promise. Beato hugs Maria one last time before Maria dies as if she was choked to death, while Rosa is dropped on a fence pole that pierces her head. The new Beatrice is rather underwhelmed at the “plain” way that they are killed. Beato tries to emphasize that what a witch does should be elegant, even if she herself went rather wild previously. To strengthen her point, Beato summons the Seven Stakes of Purgatory and awkwardly tries to emphasize that further killings should be elegant as befits a witch. Without the deaths, it would be really amusing how awkward she is. As Beato withdraws with the others while stressing moderation, the new Beatrice feels like it would be boring and disappears herself, leaving behind the dead Maria and Rosa. The time is 11:00AM. Umineko no Naku Koro ni has become even more surreal with what should have been a mere fragment of a subconscious becoming real. And I would never have expected Beato to give up the title of Beatrice so easily. I thought one needed to be trained in order to become a witch? (Thinking of Vergilia taking on Beato as a student.) Eva’s alter ego seems to also call herself “EvaBeatrice” if her cake is anything to go by: should I call her EvaBeatrice or just Beatrice? At least I know what I’ll call Beato. She did some crazy stuff during her stint as Beatrice, but EvaBeatrice looks like she’ll be even less restrained. I wonder if there will be other Beatrices in future arcs? And it could easily have been Rosa that solved the inscription first: I wonder what she would have been like as a witch. I wonder if a feminine touch would help with solving the inscription: both Ushiromiya sisters solved it while neither brother seems to have a clue. Or maybe Klaus did solve it some time ago and is feigning ignorance for some reason (where did he find the gold bar from episode I-II?). The inscription seems to have two roles: a clue to the whereabouts of the gold, and for those who believe in magic, a ritual to revive a witch. The fact that Rosa and Eva only brought up practical reasons for not killing each other implies something disturbing about them: if they could get away with it, they would kill to get what they want. The only one who knew that Eva found the gold is now dead. If Eva’s alibi shown in this episode can be believed, then Eva might start suspecting whether someone is trying to eliminate anyone who knows where the gold is. Maria didn’t make a comment about how EvaBeatrice was different from BeatoBeatrice. This might imply that EvaBeatrice is spinning her own truth separate from Beato’s truth and the mundane truth. With how time stopped during the the witch succession ceremony, it looks like it didn’t happen on the level of where meta-Battler is at. There might be a level between the real world and the meta world. For a non-magical interpretation, this could be a “symbolic”-level. Lambdadelta and Berkanstel made a direct appearance on stage, but they aren’t talking with meta-Battler and Beato on the meta level. Are they just more interested in subtly influencing the game rather than the battle of wits, or is there a meta-meta level where they usually spend their time at? What are they doing, anyways? Beato is no longer Beatrice: there may be no more red text from her. Beato had interpreted meta-Battler’s previous angry moments as just frustration at losing a little game, so she’s surprised when she realizes that meta-Battler really is extremely angry rather than just throwing a tantrum. That’s why she’s now trying to rein things in, not realizing that it’s not just the cruelty but the deaths as well that gets to meta-Battler. It looks like Eva’s alter ego really was just an inner voice of Eva (no, I don’t think Eva was ever hallucinating). So much for my thinking that it was really a witch’s doing. On the other hand, Lambdadelta did end up being a sponsor for EvaBeatrice. EvaBeatrice looks like she will be even more unconstrained. While this might result in even more cruel deaths, it might also be her undoing as her magic leaves no room for mundane truths, which could paradoxically nullify her magic. There’s definitely something strange about how Maria reacted to the Beatrices. She didn’t miss a beat in calling EvaBeatrice, Beatrice, and later when the real Beatrice arrives, Maria again reacts as if she’s been talking to the same Beatrice the whole time. Is she unable to tell the difference between the two? Or does she only see the one? I also got a particular kick out of seeing Beatrice so flustered in trying to convince EvaBeatrice to be more restrained. -Think on Maria dying some more. She’s Beatrice’s messenger/supporter yet for some reason she dies at the start of the ceremony. This is an odd change from the last two arcs – why would Beatrice kill her messenger and biggest fan girl? Although you have to wonder what Eva-Beatrice represents, if witches don’t exist. 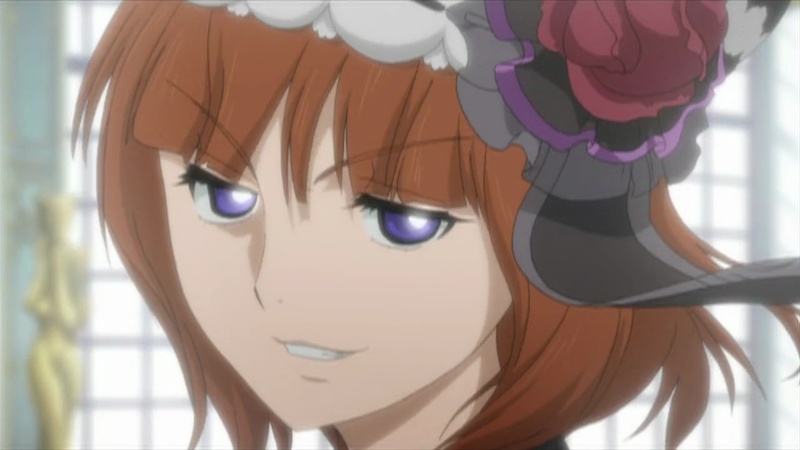 Like if we take Beatrice on Rokkenjima as a representation of the culprit perhaps, then what would Eva-Beatrice be? -The gold bar Krauss had in 1-1 was apparently from one of Kinzo’s old business partners. Kinzo gave that partner and a couple others a piece of the gold as proof of the Witch Legend and so they would work with him. Krauss acquired that bar (its not explained how) and uses it as proof of the gold legend being true. -Beatrice gave up her title because she promised she would give headship to the person (the first person) to solve the epitaph. Headship includes the title of ‘Golden Witch’ apparently. I’m not quite sure how much we can believe is shown on screen: Eva may not have needed to sneak out at all, walking outside in plain sight. Not that I think Eva is responsible, though. Sure, Rosa may hate Maria’s behavior, but i kinda have my doubts that she’d kill Maria… I dunno why, but i just have a feeling that she’d never kill Maria. Remember Battler’s theory about one person killing the others and then dying from something else? Rosa and Maria could be like that. Makes me wonder a bit if this could be a running theme in this arc. Not that I think Rosa would actually kill Maria, but it might not be too hard to believe that she could have totally lost control of her temper. Battler might bring up this sort of theory to point out how Eva and Hideyoshi could be unrelated to the deaths despite the lack of alibis as far as the others are concerned. Okay, seriously, your speculations are scaring me. the whole thing with maria not noticing the difference in beatrice’s could be that Eva was daydreaming the whole scene and what really happend was that Rosa, the abusive parent she is, got mad at Maria about the rose and in her fury strangled her. afterwards she probibly started freaking out and sliped in the rain impailing herself on the fence, it’s very possible since no red truths were ever stated about their deaths.